Gary O’Neill’s dramatic injury-time penalty helped UCD to earn a sensational win over 10-man Cork. Trailing to Seán McLaughlin’s first-half goal at the break, UCD received an unexpected boost when City midfielder Garry Comerford was dismissed in the 77th-minute. A Yoyo Mahdy equaliser swiftly followed and O’Neill subsequently kept his composure to slot home a resulting spot-kick. 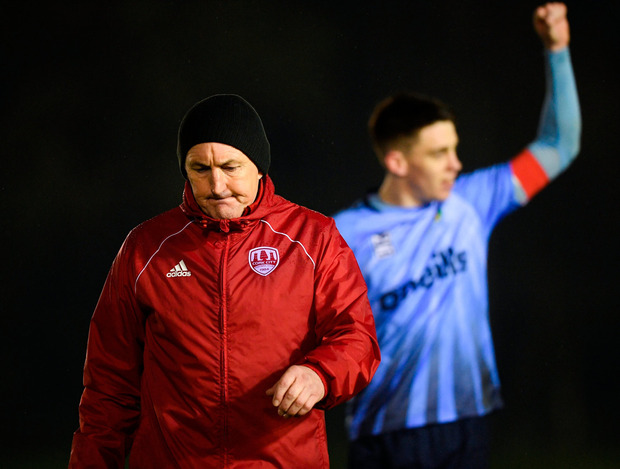 After Dean Clarke’s late finish had denied them victory at home to St Pat’s last Friday, a struggling Cork were hoping for better luck against Collie O’Neill’s outfit. And it was the visitors who eventually broke the deadlock on 35 minutes. Following Shane Griffin’s precise corner on the right, centre-half McLoughlin was on hand to scramble home. The Leesiders continued to offer the greater threat in the final-third with Morrissey firing just wide. However, they suffered a significant setback in the closing stages when Comerford was red-carded for a dangerous challenge on winger Neil Farrugia. This increased the tension in the south Dublin venue and UCD wiped out the City lead when Mark McNulty allowed Mahdy’s speculative shot to slip through his fingertips on 85 minutes. This looked set to give the hosts a share of the spoils, until O’Neill last-gasp intervention provided a final twist to the tale. UCD – Kearns; Tobin, Collins, Scales, Dignam (Davis 82); Farrugia, Molloy (O’Farrell 72), O’Neill, Doyle, McClelland (McDonald 46); Mahdy. CORK CITY – McNulty; McCarthy, Casey, McLoughlin, Griffin; Comerford, Morrissey; Boylan (Crowley 46), Buckley, Tilley (Smith 89); Cummins (Gillam 54). Uk-report.com provides you with the latest breaking news and videos straight from the biggest online news industry sources.Stay in touch with all the latest news from UK with regular updates on the main stories from the newsroom of the Uk-report.com portal news ! Follow us on Facebook and Twitter for Uk-report.com!